Holiday lists, to-do lists, grocery lists. With the end of the year come the holidays, and holidays are usually a time for … that’s right … making lists. Take a look into the process (and obsessions) of list-making from our staff. Have a sparkling holiday season and may all your lists come true. Every Christmas, from as far back as I can remember, we’ve made Christmas Cookies for Santa (and us!). If one kind is left out—even if most folks don’t really like them—there is an uproar. Tradition is important in our house, and more than ever now that my daughter Amelie has joined the world. This is one list I have to check twice! 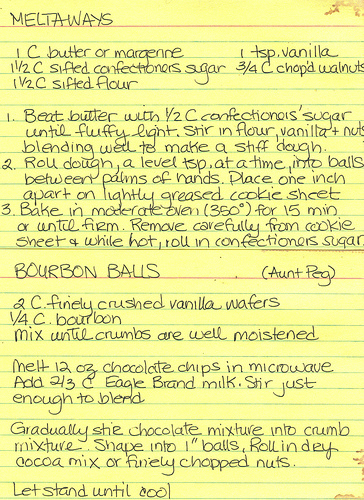 These last two are my favorites, and the recipes for them are here, written in my mother’s hand. I am a teeny bit obsessed with using iTunes to make playlists. I cannot describe how much I love music mixes. Putting together a bunch of songs in an unexpected way to set a mood or match a particular occasion just makes me all giddy. This pursuit used to take hours (when I was finding songs on record albums and taping them). Now it’s merely a matter of going through my library and dragging songs to a playlist. Such joy. For your listening pleasure, I’ve made a new playlist in honor of the holiday season. It’s not really full of holiday songs, although there are a few–it’s more about the feelings, good and bad, that this time of year evokes. Otis just has soul. He’s one of my all time faves, so I thought I’d use his best holiday songs to bookend this list. During the holidays I typically start thinking about the big stuff. We sang this at my sixth grade holiday concert. I have to believe it too. It’s cold, it’s wet, it’s romantic. What a very special time for me. Some of you may know I have a teeny teeny thing about The King. This tune is Elvis incarnate. More spiritual than religious. Besides, it’s groovy. I’m just getting all mushy now. I’ve come back to my senses. Jimi tears into some holiday faves. I can’t help thinking about our soldiers overseas now. She sang this on New Years Eve just before the ship turned over and that guy crashed into the skylight. Another groovy ‘70s happy peace and love song. I couldn’t avoid putting this one in. Kind of had to. At least I try to think it. Try to love one another now. I’m dreaming of it too. Get Dorelle’s Holiday Mix at iTunes, and at Y! Music. The best thing about holidays is traveling, and whenever you travel, it’s critical to bring the right gear along with you. So this is a time when lists come in handy, to help you make sure the right luggage is there. I have a small application in my Palm Pilot that lets me make all sorts of checklists. I use Checklist by Handmark, which allows me to make several lists, sort the items, and even beam lists to my wife. Once you check an item, it can disappear, shortening a list until it’s done without the need to scroll down. 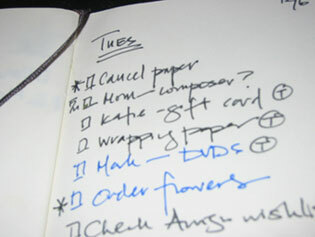 My longest list is for doing groceries, but I rarely use it–paper and memory are handier for daily stuff. But the lists I force myself to use are my packing lists. I have one for weekend escapes, holiday vacations, and another for camping trips. Of course, they all include my camera gear, the difference is made by the food and cooking supplies, travel documentation, and kinds of clothes needed for the situation. Using these lists, it is safer to drive away without the feeling that you have to find out what you left home before it’s too late to turn around. Ta-da Lists, a free service from the good folks at 37 Signals, are a great way to create and manage lists online. (Really–it’s free). After a painless registration, you can create as many lists with as many items as you need. Just check an item and it moves to the bottom of the list, signaling it’s completed. Editing lists is effortless, but reordering items is a little clunky. You can also share lists with others, email them to yourself, and even set up an RSS feed. I tend to use online lists for longer-term inventories of things like gift ideas, repairs around the house, and music I want to buy. Think of a great gift for someone six months before his or her birthday? Jot it down online. Or, if I read a review of a CD I eventually want to investigate, I’ll add it to my “Music” list. This way you can snowball ideas, thoughts, and catalogs of things over time. The portability of Ta-da Lists is key. Anytime you’re online you can access your stuff. OK, it’s no Memex, but it can help you recall things. If you travel a lot or move between computers, it’s quite handy to have a single record. You get a simple URL in the format “yourusername.tadalist.com”–very easy to remember. Daily to-do lists are better on paper, close at hand, in my opinion. So it’s a combination of old-fashion, handwritten to-do lists and online list management that helps me keep track of things. 2005 was a challenging year for me; big changes in my life have forced me to reexamine some of my values and objectives. As part of this process, I’ve been trying to become better attuned to my inner voice—to approach important decisions in a more intuitive manner. One tool I’ve used during this time is what I call my “mantra box:” a list of phrases and words that I’ve come across in my reading, or in interactions with others, that resonate deeply with me. Here is how it works: I keep a stack of 3” x 5” index cards and a Sharpie marker with me most of the time. When I come across a phrase that “calls” to me, I immediately write it on a single card in large block letters. It goes into my mantra box—one of those cheap card boxes you can find at drugstores. I try to keep my “judging mind” out of the collection process; some phrases are trivial, obvious, or tacky. Others are quotes from personal heroes. Still others are somewhat mysterious at first; the full reason for their attractiveness is only revealed to me at a later time, when I’m in a more contemplative mood. All of them go into the box—the sole criteria for admission is having struck a deep chord in me. While I pretend not to be cautious about music, I do tend to try a track or two before I buy an album. About once a month, I view the handy “Buy Me” smart playlist I created in iTunes. In it, neatly sorted by Play Count, are the tracks I’ve been listening to most often. 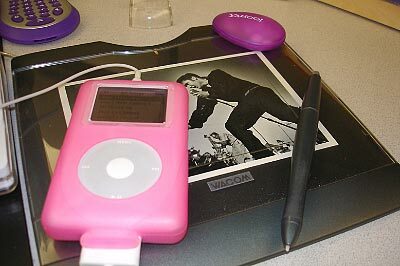 No need to think about value of the purchase or an album’s potential for pleasuring. Chances are, if I’ve listened to a track at least once every three days for three weeks (roughly), I should buy the album. The Buy-Me recommendations are often a surprise to me, which is kind of a fun by-product of the system (no pun intended). * Checkbox and “f/u:” Indicates an open task that needs additional follow-up before I can complete it. When a task is complete, I put a check in the checkbox, allowing the satisfaction of crossing something out without rendering the item illegible. Oftentimes, I must refer back to completed items, so I prefer to have them available. Sometimes, a task is still unchecked after a significant period of time or several pages in the notebook. In these cases, a strikethrough is necessary, and the unchecked item gets moved to a new page. When an entire list is complete, I put a strike through the entire page. I write lists for lots of things, though I wouldn’t call myself obsessive. I like the legitimacy of putting something on a list. It means a commitment of some sort—something to be bought, a task to be completed, a thoughtful intention to do something. I have the daily-weekly-monthly lists for work, but for the rest of my life, I mainly make lists for must-dos such as groceries, Christmas gifts, and errands. There is no formality to my lists. They are as basic as can be—words on paper. Often they’re written on small scraps or Post-Its with whatever I can get my hands on, pen if I’m lucky, pencil crayon if I’m not. My favorite lists are ones I do most infrequently—life goals and ambitions. The list of big dreams. I’ve done these off and on for years, and they follow a fairly strict format. Things can’t be as simple as “win the lottery.” Items on this list have a certain amount of thought behind them that address the particulars of how to make something happen. My practice has been to spend time creating these lists, and then promptly forget about them. I now tend to save them on my computer, which means I could look at them occasionally, but I never do. Since I’m rather disorganized elsewhere in my life, these lists are usually lost, then turn up accidentally while I’m going through old notebooks or papers and files. The best thing about these occasional findings is remembering what I dreamt about long ago, and what I can check off. Much to my surprise, I seem to have had a plan for how I wanted things to be. 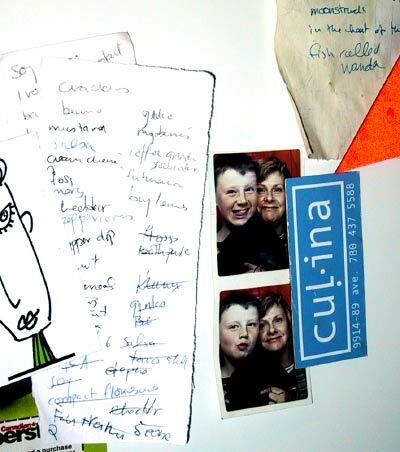 I have the two kids, a house by the ravine, work I can do from home, a Master’s degree—all things that have appeared on my life’s grocery lists over the years. I think it comes back to the notion that putting something on a list legitimizes it and increases the likelihood that it might actually happen, whether you’re talking about getting a new job, having another baby, or buying Cheerios. I love Jorge’s Mantra box list – both the idea and the contents. I’m going to create one to go with all the other lists in my life. I like really like the mantra box idea as well. I have a couple of notecards I keep a list of phrases on to inspire me but not a whole box. I also keep refrigerator lists. I love them due to the fact they are in your face every time you get something from the fridge. I love Pat’s closing paragraph. It was a great end to a great article. Thanks. I agree: when committed to a list, it’s like a contract, something with a higher likelihood of getting done. *** Like Jorge, I have *3 x 5 index cards* all over the place to help capture story lines, dialogue, gift ideas, intentions, even found objects. I dump them into an old tin, and every so often I read, sort, toss, file, or act on them. *** Jim’s mention of the *Ta-da Lists* is just what I was looking for to manage my reading, listening and watching lists. Can’t wait to check out the site. *** And like Pat, I also run across old to-do lists when pulling an old book or journal off the shelf. It’s like running into myself backwards. *** Thanks to all the contributors for their inspiration-information and pics. I’ve always been a fan of paper-and-pencil to-do lists… but once about half of the items are crossed off, it becomes harder to pick out the remaining items. Liz Danzico’s open-box lists are a great solution – it’s easy to scan the list for open boxes, even when most of the items are checked. Thanks Liz! Follow-up to the closing paragraphs about life’s lists and such… Emmit Smith, the great Dallas Cowboy running back, had the best statement about lists that I every heard. It was in an interview where he talked about the things he had accomplished and how he approached the game and his life. Increasingly I find myself working on multiple machines in multiple environments and I am currently trying to keep lists in one place, but in all places, Google, Yahoo and the like all offer global repositories for lists and notes – but I am still not convinced. 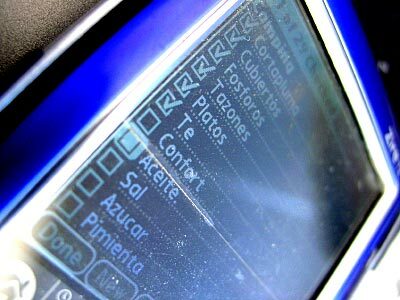 As a fan of GTD I used to use a Palm for lists etc. But have returned to pen and paper in a moleskin for it’s sheer ‘scribblibility’. Please add a few large trash bags to your camping list. I have found them invaluable for surprising rain storms, taking wet things to the laundromat, and serving as immediate rainwear. Thank you for a terrific list! This is a great site – I plan to implement Jorge’s Mantra box today!